"I am very sad, my friend's had two great Mexican restaurants but they closed the one by my house and the cook at the other is not as good. So, now I am planning on learning to cook good Mexican all by myself! Do you have a good recipe for Chile Colorado? I adore that chunked beef in sauce, but when I asked them the recipe, a lot of what they used didn't resonate with me..."
That would be my friend Alex from A Moderate Life. To be completely honest though...I had never heard of Chile Colorado until she mentioned it. So, I turned to the expert (not Mexi, the other one...Mr. Bayless). Actually Mexi hadn't heard of it either, so it must not be popular in the region of Mexico that he is from. I kind of went into it thinking that it would be a type of stew, similar to chili. Like chile con carne. It's not. What it actually is is a filling...for tacos, tamales, enchiladas...you name it! So, carne con chile. Well, okay then. Although Rick gives a few variations on chile colorado, I decided to go with the one that uses beef. It was, afterall, the chunked beef that Alex adored so much...how could I not? Heat a heavy skillet over medium and tear chiles into flat pieces. Toast them on hot surface a few at a time, pressing them down firmly w/ a spatular for a few seconds, until the crackle and change color, flipping and repeating. Transfer them to a large bowl and cover w/ boiling water, using a plate to keep them submerged, soaking for 30 minutes. Drain, reserving ~1 c. of the soaking liquid. Transfer the chiles and reserved liquid to a blender jar. Add garlic, oregano, & cumin (pulverized first if using whole seeds) and blend until smooth. Strain through a medium-mesh strainer. Heat the fat in a large skillet or Dutch oven over medium-high. 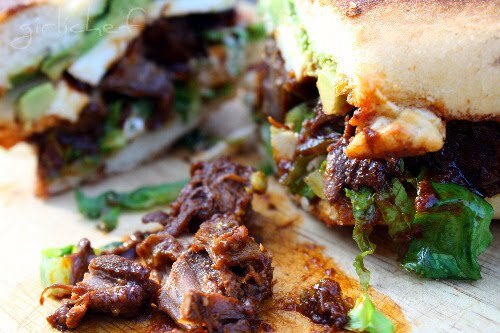 Dry the chunks of meat w/ a paper towel and lay in hot skillet in an uncrowded, single layer. Fry until meat is nicely browned, ~10 mins, turning and scraping as needed. Add the chile puree to the pan. Continue to fry for ~4-5 mins, stirring & scraping, or until puree is very thick and noticeably darker. Scrape mixture into medium-sized saucepan (or just leave it in the Dutch Oven). Stir in salt and liquid. Bring to a boil, partially cover. Reduce heat to simmer and cook, stirring occasionally for 60-90 minutes, or until meat is very tender. Just before serving, thin with a little water or broth and stir in the masa harina. Let simmer until nicely thickened. Adjust seasoning, if necessary. 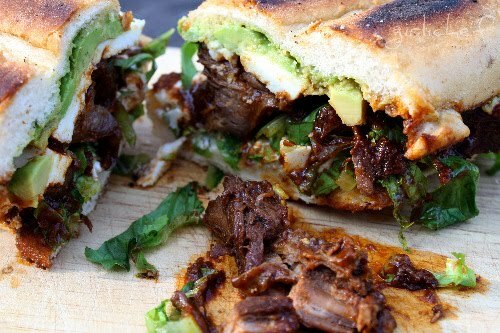 Serve with a side of rice and beans, or scoop into a bolillo or telera roll that has been cut in half and toasted lightly with your toppings of choice for a delicious torta! 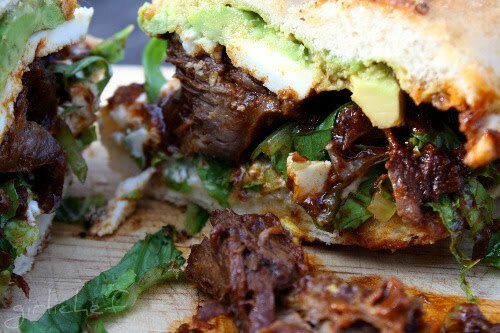 I went ahead and used my filling in tortas for dinner that day. I toasted the bolillo on the cut sides, then flipped and added crema, romaine, cilantro and the hot chile colorado. I added the tops and toasted both sides...sliding in some avocado at the end. Soooooo good. And Alex, I couldn't keep my fingers off those chunks of beef, either! I hope this is one that will resonate with you!